Made with super seeds. Wheat, gluten, dairy, egg, nut and soy free. High fibre. Source of protein. Suitable for vegans. Kosher - KLBD.Say hello to great tasting wraps Wow! 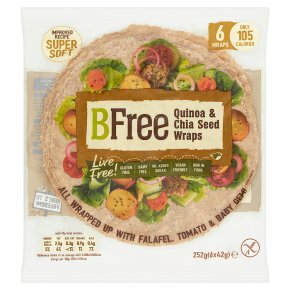 Delicious, light and super healthy Wraps made with super Seeds. Red Quinoa Seeds are a complete protein containing all 9 essential amino acids. Chia Seeds are high in fibre and high in calcium. Teff Seeds are high in iron and omega 3. Flaxseeds are high in protein and B vitamins. Be Free to boost your nutrition naturally with the benefits of super seeds!